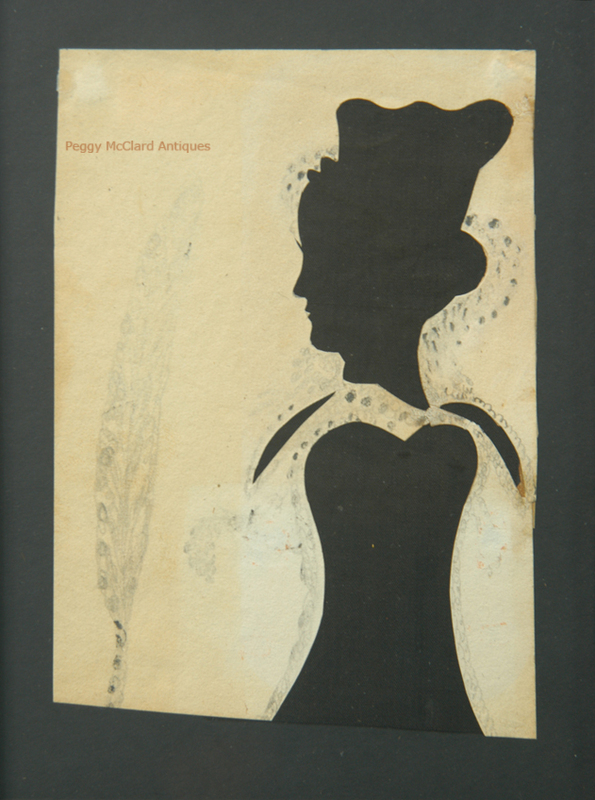 This is one of those wonderful American folk silhouettes that show the creativity of the art of silhouette in the 19th century. This lovely, quirky lady is hollow cut with graphite details around the edges of the profile. The lady wears an absurdly large hair comb (however, it is probably not much of an exaggeration of the real thing) set high on her head to hold her Apollo knot hairstyle in place. Her cut eyelash is appropriately thin and delicate but stands at an exaggerated angle to her face, giving her the look of having false eyelashes. Her facial features are delicate and well executed. There is a break in the cutting below her neck to introduce her ruffled collar, which is depicted by long curved cuts to the front and back of her hollow cut body which is topped with a heart. 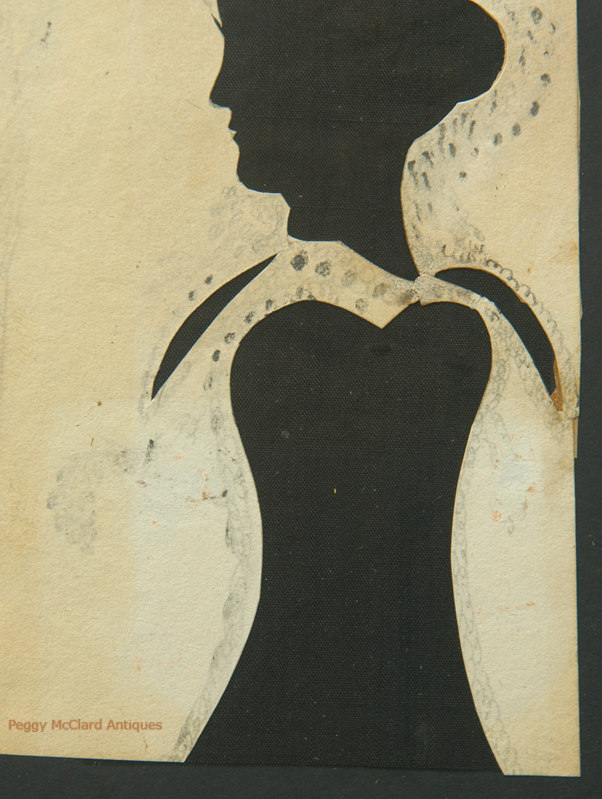 Her profile is enhanced by pencil dots, circles and squiggles around the edges of the silhouette to embellish her hair, collar and dress. In front of her stands a tall, pencil drawn arrow. I have no idea of the meaning, but it adds to the uniqueness of this wonderful piece of folk art. [Actually, a reader just suggested that it is a quill pen, which would represent that she was educated. Bravo!] 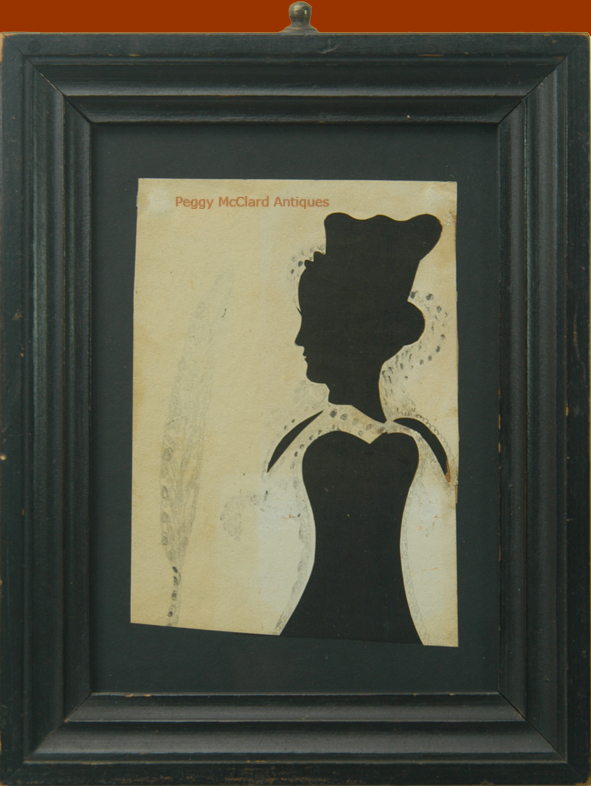 I acquired this silhouette in the current period, black painted moulded wood frame. 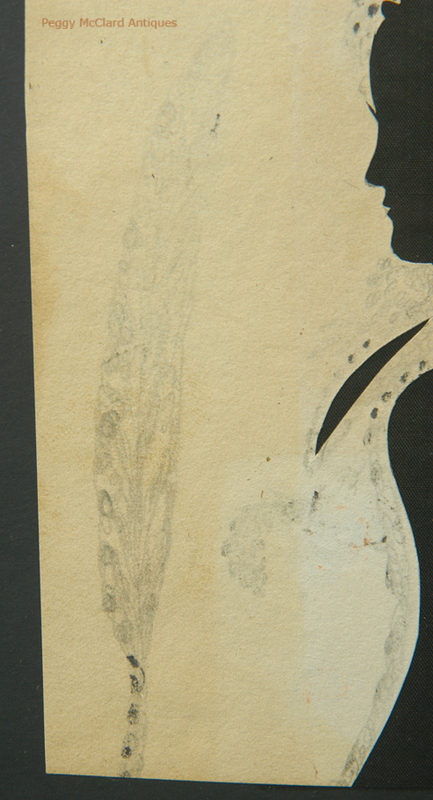 However, the silhouette was placed behind a paper mat which covered the graphite drawn arrow. 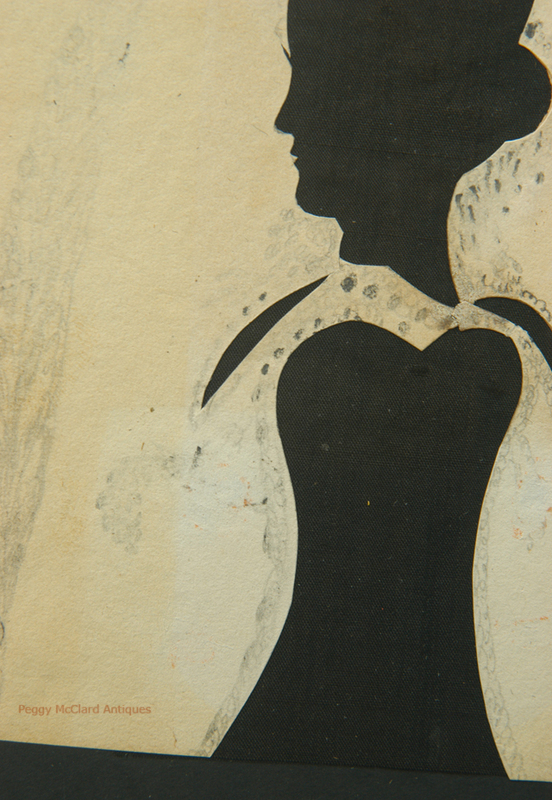 I removed the mat and floated the silhouette and her original silk backing fabric onto a piece of acid-free black paper. As you can see, the edges of the paper are not cut straight--I, again, thinks this adds to the folk quality of this silhouette and would never think of cutting the edges straight or covering the uneven edges with any kind of matting. The black backing of the figure is the original (or at least period, as there is no way we can know for certain that it is original) black silk fabric. 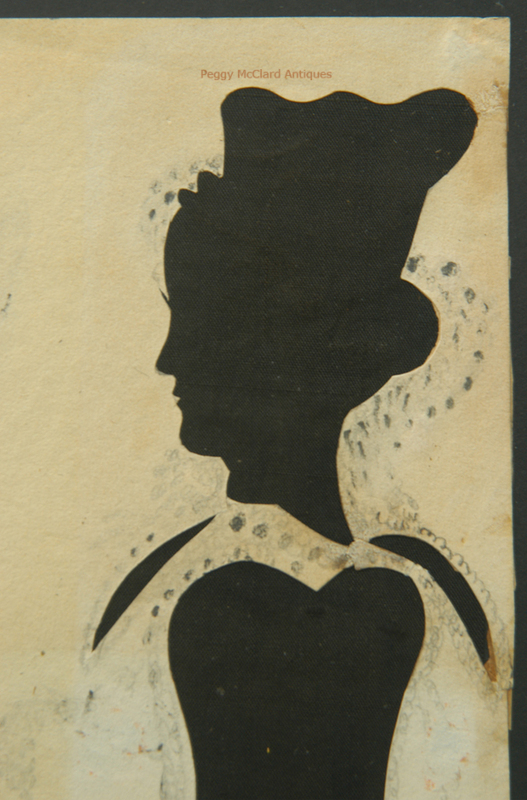 You can see the edge of the fabric at the bottom of the silhouette, where it meets the black paper. There are small repairs to paper tears at the neck and collar area. There is also browning to the paper with some very light areas to the paper where it has not browned. You can see the color variation clearing in the photos. In person, I find none of these small apologies objectionable for such a rare find. The size of the paper is about 6" x 4". The framed size is 9" x 7". The frame has the original brass hanger, but the loop is missing. I've added a wire hanger to the back. I can remove the loop-less hanger if it bothers you, but I thought someone might have a loop that could fit into it. I somewhat uneven piece of brass wire, bent to fit would even be appropriate for the folkiness of this piece. Circa 1830, likely Maine.